As an animal behaviorist and dog trainer/lover, I always strive to make sure that my dog, Callie, is healthy and happy. To do this, I implement my 3 pillars to a better dog: exercise, diet, and training. These pillars may sound easy enough, but surprisingly many people make mistakes when implementing them. One big mistake that I’ve seen among my clients is that they aren’t giving their dogs enough exercise. A common misconception is that if your dog spends a lot of time running around the backyard or playing inside the house that they are getting enough exercise. However, the opposite is true! Your dog is not getting enough exercise if you just let them run around your backyard, and walking your dog isn’t always a sufficient amount of exercise either. Your goal should be to get your dog’s heart rate up! To get Callie the exercise that she needs, I’ll usually play a game of fetch with her. I’ll throw the ball and she’ll run and get it, then run back to me with the ball to do it again. We keep doing this until she decides that she wants to stop or take a break. This way, I’m giving her the opportunity to get as much exercise as she wants. Dogs are very intuitive animals, and they know how much exercise they need, so this method is a great way for us to work together in getting her some exercise. After a good exercise session, your dog should come home and only want to lie down and rest because they got their heart rate up! If you aren’t able to take your dog outside to exercise, there are still alternative activities you can do inside. You can play tug, keep away, or fetch in order to get their heart rate up while indoors. As long as they’re exercising, your dog will be healthier and happier! The second pillar is very important: diet. I feed my dog Answers Pet Food, which offers food for both dogs and cats. 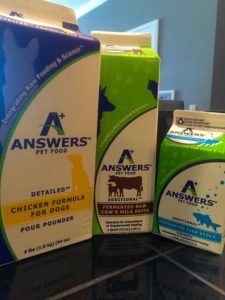 Answers Pet Food is a raw pet food company that “enhances the nutritional value of raw food through the process of fermentation.” They offer four unique formulas (Straight and Detailed for dogs, Detailed for cats, and Additional for dogs and cats) that come in 100% recyclable packaging. I feed my dog the Detailed formula meat drizzled with the Additional formula fish stock, and I can confirm that Answers Pet Food truly is the best dog food. Callie has more energy and a beautifully soft coat because of all the nutrients she’s getting from this food. Since she’s using all of the food that she’s eating, Callie also has smaller poops. At night, she gets either fermented goat’s milk or cow’s milk, rounding off her balanced, nutritious diet. If your dog is getting all the nutrients that they need, along with extensive exercise, they will be extremely healthy. Additionally, you may see a decrease in problem behavior like chewing, jumping, and barking because they’ll be too tired and happy to do them! Training is the last pillar, and probably my favorite one. 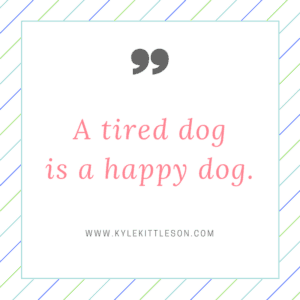 I often hear my clients complain that even after exercising their dog and feeding them a nutritious diet, their dog is still acting crazy or showing problematic behavior. That’s where training comes in. The previous two pillars have focused on working the body, and now we’ll be focusing on working the mind. After going to work and mentally exerting yourself for eight hours, you feel tired because you’ve been working your brain all day. Your dog needs the same kind of exercise for their minds; they need to be able to think and problem-solve. I make sure that Callie does her training every day. Somedays she’ll learn new behaviors, but she mostly puts into practice what she’s already learned. Our trainings can include basic skills, such as sit, stay, lay down, etc., and we’ll also do some fun behavior exercises. These mental exercises help her to stay healthy and happy, and they also tire her out more than an hour at the dog park! Now that I’ve told you my three pillars to a better dog, it’s your turn to put them into practice. Tully’s Training offers digital dog training and in-person training for your dog in three locations: Los Angeles, San Diego, and Seattle. Their team is made up of experienced animal trainers with diverse backgrounds, so they have “a unique perspective and understanding about how behavior works and how to modify it effectively.” Tully’s Training works with you to create a personalized training plan for your dog that matches your budget, lifestyle, and training goals. Please check out the rest of my dog training blog to find more information on how to create a healthier and happier pup! If Calie has puppies I would like one!! You guys are so cute! Did you know that each year 1.2 million dogs are hit and killed by a car? My easy and effective three-step process will teach how to train your dog to avoid the street. Check out the Street Safe Dog Online Course.